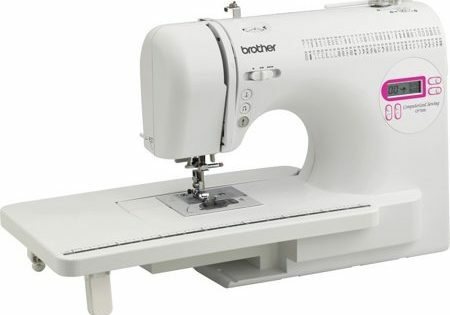 With its straight, clean lines and sturdy, motor, the Brother CP-7500 computerized sewing machine combines form and function in one sleek little package. The candy-pink trimming gives it a cutesy, whimsical touch that any girl is sure to love. The CP-7500 comes with a really nice selection of 70 built-in stitches from the basic utility and quilting stitches to fancier decorative and heirloom stitches. When you consider that many of these stitches can be adjusted to up to 5 mm in length and up to 7 mm in width, it all adds up to 110 varieties of stitches. The extra large length and width add even more versatility for anyone who loves sewing home decoration items such as cushion covers, bedspreads and curtains and also for the avid quilter. The 7 styles of 1-step buttonholes make easy work of making buttons with literally the push of a button. That’s right! All you have to do is push one button and the machine does the rest. It’s that easy! With plenty of automation combined with a neat mix of easy-to-use features and advanced sewing features, the Brother CP-7500 is an excellent beginner machine that will serve you will as you progress with your sewing skills. The Brother CP-7500 used to come with 7 presser feet, zigzag, blind stitch, zipper foot, monogramming, overcastting, button fitting and button hole. The recent addition of 2 feet, the quilting foot and the Walking foot at the same price comes as a really cool bonus. Automatic start up features and very clear instructions make the machine easy to set up and go. The work light isn’t too bright and cannot be used as the exclusive source of light. Using an additional source of light is a rather easy solution to this. Bobbins are an unusual size. Buying extra bobbins when buying the machine is advisable. Marketing pundits predict that come Christmas time, the Brother CP-7500 is sure to be one of the top holiday gifts. Why this model especially? Three main reasons stand out – it looks cool, it has some fabulous features and at less than $200, it offers tremendous value for money! A 3-in-1 combination that’s hard to beat!